When I got married, I didn’t even think of putting together a survival kit. I just hoped that everything went as planned. I was lucky…..thank goodness. There is a Wedding Day Survival Kit that you can buy that is packed with all 30 essential items that a brides or bridesmaids may need for the wedding day. I was surprised to see 30 items, but they are a very good idea. Items include toothpaste, toothbrush, deodorant, tissues, hairspray, static remover, Band-Aids, mints, clear nail polish, bobby pins, double-sided hem tape, stain remover, pain relievers, sewing kit, super glue, brush, dental floss and lotion. 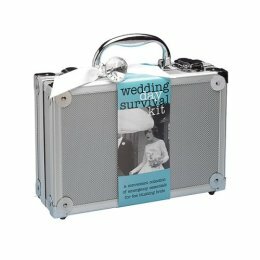 If you are interested you can purchase the Wedding Day Survival Kit from Target for $49.99. You can even buy a survival kit for the groom.